Some of the longest queues at Milan Expo could be found at the German Pavilion. Entitled ‘Field of Ideas’, the pavilion used some of the latest projection techniques to create an interactive experience, appreciated by young and old. 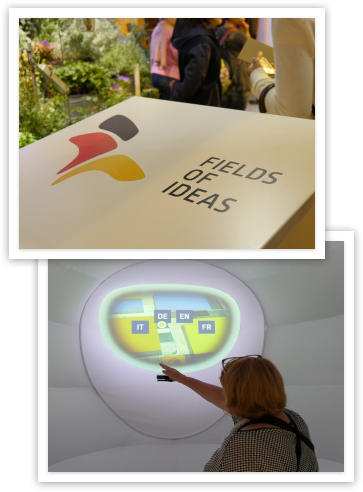 Fields of Ideas was the realisation of the German Federal Ministry of Economics and Energy, Messe Frankfurt was entrusted with the organisation and running of the German Pavilion at Expo 2015 in Milan. The design, planning and realisation of the German Pavilion were taken on by the ARGE, a consortium made up of Milla & Partner (Stuttgart), Schmidhuber (Munich) and Nüssli Deutschland (Roth near Nuremberg). Milla & Partner is responsible for the content concept as well as the design of the exhibition and media. Schmidhuber is responsible for the pavilion's spatial concept, its architecture and general planning and Nüssli for project management and construction. At its peak, the pavilion welcomed 16,000 people a day. Each visitor was given their own personal SeedBoard – an innovative and surprising tool that actively and playfully involves them. The SeedBoard serves as a screen for text, images, films and games. Visitors used it to initiate and navigate exhibits. 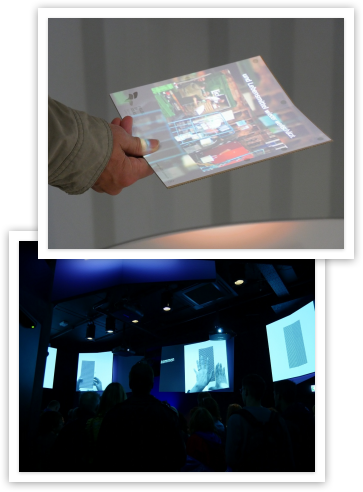 The content was projected using Panasonic PT-DZ570 1-chip DLP projectors, in combination with Optitrack sensor technology. By placing the SeedBoard under one of the 19 stations, up to three visitors at a time had individualised content based on their language, which was dictated by a dot formation on the SeedBoard, and the position of the SeedBoard. Lifting the SeedBoard moves the content forward. This was used most cleverly on a time line of the regeneration of the Lake of Constance, showing the efforts over the last 50 years to clean the water there. With such a new concept it was important that visitors were given a short demonstration on how the technology works. To achieve this, the Pavilion ushered guests in to a pre-show area. Here, visitors met ambassadors for the first time and were introduced to the exhibition. Using seven PT-RZ470 laser/LED projectors, visitors were given an explanation of how to use the SeedBoard. The projectors excellent brightness and 20,000 hours of maintenance free operation ensured that no maintenance was required across the six months that Expo was open. An example of the ‘active’ nature of the Pavilion was a pair of umbrellas, linked to a single PT-DZ680 1-chip DLP™ projector, with 6,000 lumens of brightness. When visitors opened the umbrellas, content was delivered to the centre of the umbrella, so that it can be read from underneath. Again, this used Optitrack sensor technology. Brightness plays a huge role here as the umbrellas were placed in an area with significant levels of daylight. The projector displayed the content perfectly, while turning the umbrella clockwise moved the content forward. Finally, two further PT-DZ570 projectors were placed in two helmet shaped domes. Visitors are encouraged to step in to the domes and waving their hands in front of the projection brought interactivity to the content. At Expo 2015, Germany presented itself as a vibrant and fertile landscape, filled with ideas and solutions. It depicted agriculture as a strong, modern sector as well as an intrinsic aspect of its unique cultural landscape. “At times, visitors faced a significant wait to get in to the Pavilion. If, once inside, they found exhibits that didn’t work or weren’t engaging, that would be a huge disappointment. Milla & Partner delivered a great mix of fun and education. We are delighted by the response we got from visitors throughout the Expo,” added Marion Conrady.